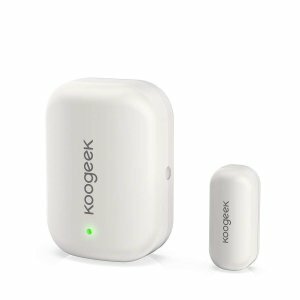 Amazon.com offers the Koogeek Door Window Sensor Work with Apple HomeKit No Hub Required for $23.99 via coupon code FZE94KLG . You will immediately receive the corresponding notification message on your phone when the door/window opens or closes, so you can discover the intruder in time. It also keeps up to 100 records on your phone automatically. You can check whether the door/window is on or off by using the Koogeek App or Apple Home App. Also, you can monitor multiple sensors at the same time and check whether the windows are closed before going to bed or leaving home. Double Check your doors and windows are closed whether you’re traveling or just out for dinner. (Remote Access requires an Apple TV (tvOS 10.1), iPad (iOS 10.1 or later) or HomePod (iOS 11.3 or later) configured as a home hub). Setup an auto trigger on the Apple Home or Koogeek Home App to control other HomeKit compatible accessories. For example, turn on the lights to greet you when you open the door. (Setup trigger on Apple home require an Apple TV (tvOS 10.1), iPad (iOS 10.1 or later), or HomePod as a home hub, on Koogeek Home App don’t need a home hub. No complicated installation tools are required. The sensor can be installed with double-sided adhesive tape in just a few steps and you can check the remaining power on the app, which last up to 1 year in battery lifetime.